A passion for history. . . I grew up in Akron, Ohio. I'm published in academic and professional journals, but fiction gives me an opportunity to practice the art of storytelling. A PhD in organization development led to experience in the behavioral sciences and fueled a desire to write about interesting characters, real and imagined. I'm also passionate about history. When not writing, you'll find me out in the community engaged in organizations that make a difference, reading, walking, visiting historical places, traveling, or watching films from all eras. An ancestor of mine founded early Hollywood in the 1900's, so the love of films comes naturally. There is still disagreement among family genealogists if the Poe side of our family is related to Edgar Allen, but it could be a helpful gene. I married my high school sweetheart and have two grown children, and two grand-Corgis. My mother's family always talked about my grandfather, a great aunt, and a famous great uncle who died in one of the first aeroplane crashes. The three left rural Ohio, heading west. As I started investigating them, I saw that there was potential for unique and interesting stories. Yours in a Hurry is a about strong women and men. At the beginning of the last century, the culture was changing quickly –and those who embraced change were in such a hurry! Life changes for the Hartle siblings when their prosperous parents die suddenly in 1901. Now it's 1909, and the three oldest—Anna, Addison and Purl—have come of age and use their generous inheritance to leave their small Ohio village. The characters experience changes in America and abroad at the time of the story (1908-12), and meet known characters from the period as well as some created along the way. Experience historical events with characters from Hollywood to Europe and the Pacific Rim, including famous film stars, aviators, and American heroes. The siblings sometimes visit Ohio, but not for long. As Addison often expresses at the end of his letters, they are "Yours in a hurry." 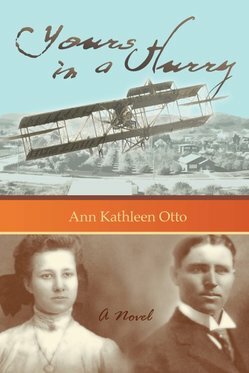 Click the blog link above to see facts about this book, the characters, the historical period, and Ann's other writing projects which are described on the Books page.